Rev. 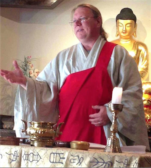 Charama is the Founder and Guiding Teacher of Only Love Zen Sangha. An ordained Zen priest in the lineages of Korean and Japanese Zen, Ven. Charama has made love his life's direction. So it's no surprise that "How may I help you?" is one of his favorite questions. Not Wind. Not Flag. Not Mind. Copyright © 2010-2018 Ven. Charama Bhavika and Only Love Zen Sangha.